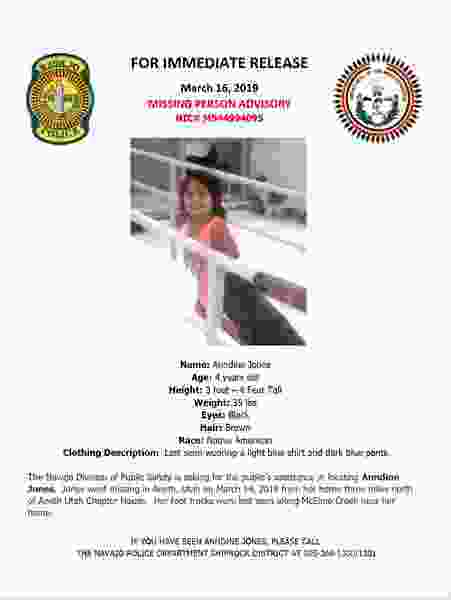 (Navajo Police Department) Police are searching for Anndine Jones, who went missing Thursday, March 14, 2019, near Aneth, Utah. FOX 13 reports that Anndine had been at her home near Aneth and Montezuma Creek on Thursday when she disappeared. According to a missing person flier from the Navajo Police Department, authorities found Anndine’s footprints along McElmo Creek near her home. She was last seen wearing a light blue shirt and dark blue pants. The Navajo Nation Amber Alert system was not activated because according to the press release, there are no indications that Jones was abducted. She is, however, listed with the National Crime Information Center (NCIC) as a missing person. Community volunteers will continue organizing search teams, and the Navajo Police Department said it will remain in the area to investigate any leads generated by the volunteers. Anyone with information should call the department’s Shiprock (New Mexico) district office at 505-368-1350 or 1351. Read the complete story at FOX 13.